That yellow certainly makes the floral images pop! Well done. Wow.. beautiful cards..love the bright colors..
Beautiful card, love the bright colors. Absolutely love the bright color! Stunning cards! Wow! bold and bright and beautiful! Love these bold and beautiful cards. The bright backgrounds really pop! Gorgeous!!!!! Thank you for inspiring me to create. Wow, so bright and beautiful! Love these!! And I love the 'Strangeness' set by SSS - more for the birdies, but also the sentiments. (Hope you have a wonderful 10th anniversary!!). Your flowers on the yellow background are lovely. The vibrancy of these cards is awesome!!!! Beautiful cards. I love the vivid colors and the striking yellow background. 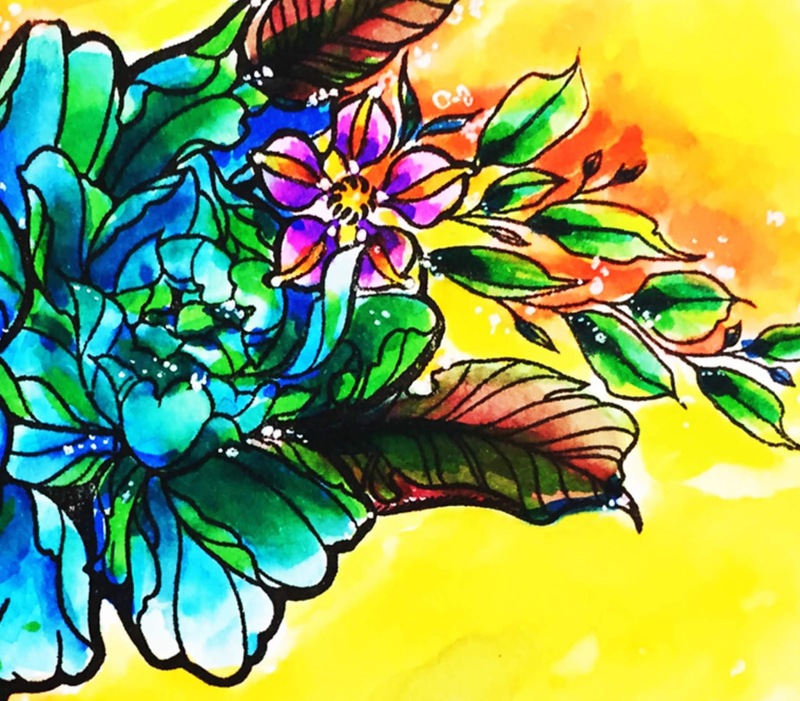 Gorgeous watercolored florals! The bright yellow background really makes your flower pop. Thanks for sharing your inspiration and for joining the celebration blog hop. These are pieces of ART! WOW! What vivid beautiful coloring! Your Cards....well...talk about over the top gorgeous!!! They hit that Jackpot mark on the wheel.......I loved them both so much..!!!! Wow! Such brilliant colors! Beautiful. Bold and beautiful, that says it all. Thanks for sharing. I love the beautiful yellow background to your flowers - really makes them stand out and look even more gorgeous! 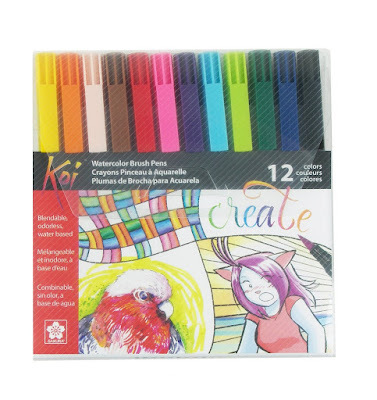 Super coloring - I'd not seen the Koi markers before but may need to try them out! TFS!! WOW Kimberly these are bright and gorgeous! What beautiful cards. Your cards are lovely and Happy early Anniversary! Happy anniversary - a couple day early. the warming yellow for the backdrop. Wow! Your card is stunning! Love the colors and the depth of color in your flowers! Beautiful colors! I love how you colored the flowers! Thanks for sharing! Really great card, love the colors. Wow....that looks AMAZING with the sunny background!!! Beautiful!! 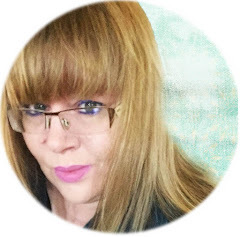 What a treat to have found your blog! The vibrant florals are gorgeous! Beautiful and wonderfully vibrant cards! 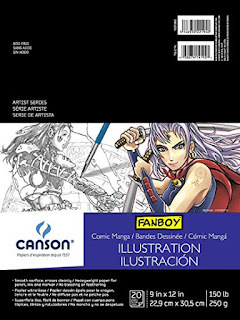 I love your watercoloring style - fantastic! Wow! You cards are so bright, bold, and beautiful! Vibrant and bold creations! :) So colorful! Gorgeous cards! Your color choices are amazing! Wow, wow, wow - your use of color is stunning, LOVE these!! Kimberly, your cards are over the top...WOW, the coloring and the bold and bright colors are eye stoppers! Fabulous cards! Happy Anniversary! Love your colorful cards - so vibrant and so pretty! 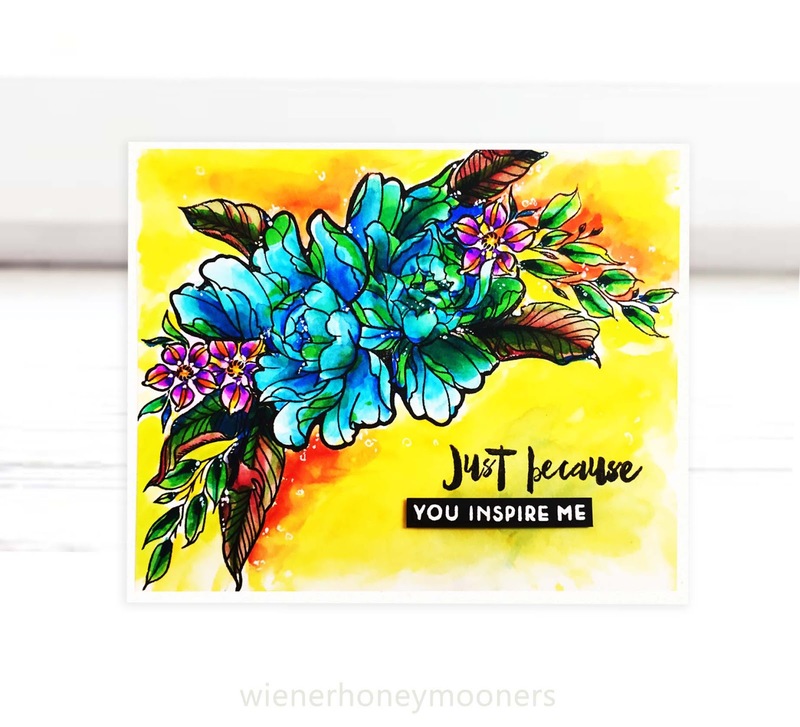 Your choice of a bright yellow background makes the cards look like they are in the bright sunshine & we all know how good sunshine is for flowers & for us as well. When I look out the window & see blue sky & sun, my spirit is uplifted, no matter how I may be feeling that day. Both your cards are incredible, but I am particularly taken with the one with the bits of watercolour pooled around the edges of the arrangement. Love that look. Thanks to the sponsors of this hop & the chance to win, but I must say just seeing the creativity & beauty & reading some people stories is a gift in itself. That yellow really grabbed my attention! Yellow is not an "often go to" for my card making. However, Your cards are stunning with this background. Thanks for helping me see this! Congrats on your anniversary! Such beautiful cards. The backgrounds are stunning. Love your contrast with the background! Gorgeous cards! 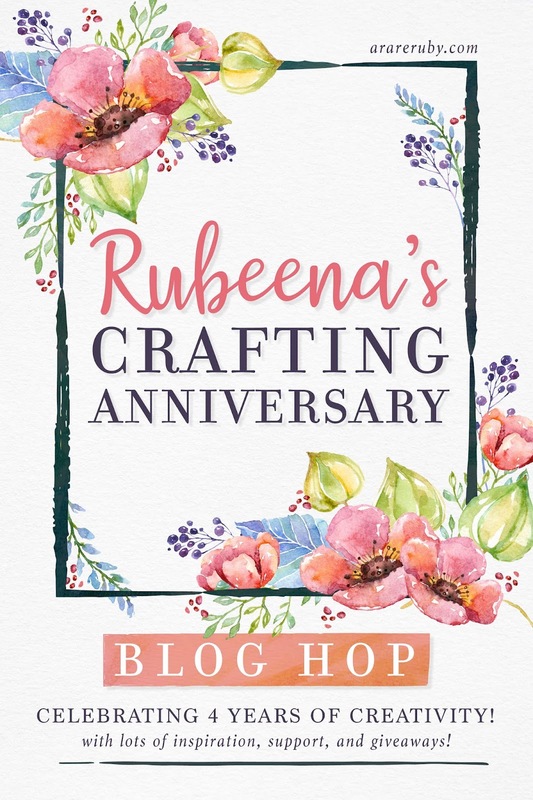 Enjoying all these beautiful creations along the hop to celebrate Rubeena's crafting anniversary! Gorgeous card! Your coloring is amazing. Wow, what gorgeous cards! Love the boldness of the colors. Wow! 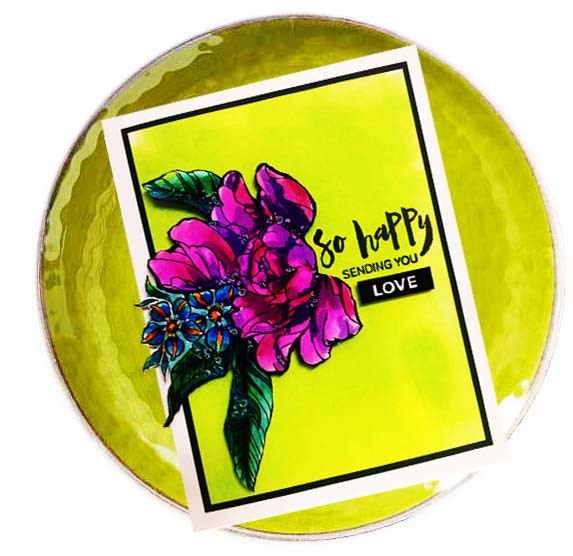 Love the bold colors on your lovely cards! What a fabulous card! Just so bright and wonderful and cheery! So vibrant!! I love the yellow background. It really makes the flowers pop! What a beautiful bright colours! But, a question: the background of the second card is a yellow cardstock or you coloured it? Thanks for sharing these stunning cards. Gorgeous cards, both of them, the yellow background is truly striking! Love these! What vibrant cards. I just love how the yellow makes everything pop. Thanks for sharing. Happy 10th Anniversary!!! Buon Anniversario!!! I'm totally in love for your stuninng cards!!! Beautiful colouring!!! Awesome cards! I especially love the bold bright colors! Congrats to Rubeena! Absolutely gorgeous!! I love the stamp set!! The colors are so bright and awesome. I have these markers and didn’t know they could do this!! Great cards! They are so vibrant and delightful! Just so bold and vibrant and vivid! These are fantastic! That SSS set get me every time I see it. You just put a cap on the favorites. Just gorgeous. Love all your cards. Beautiful post, Kimberly! Wow! Such vibrant cards! These are fantastic! 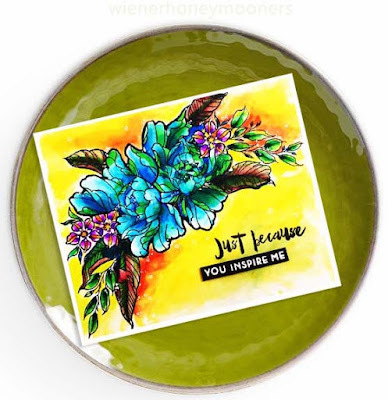 Thank you for sharing them and being a part of the blog hop! 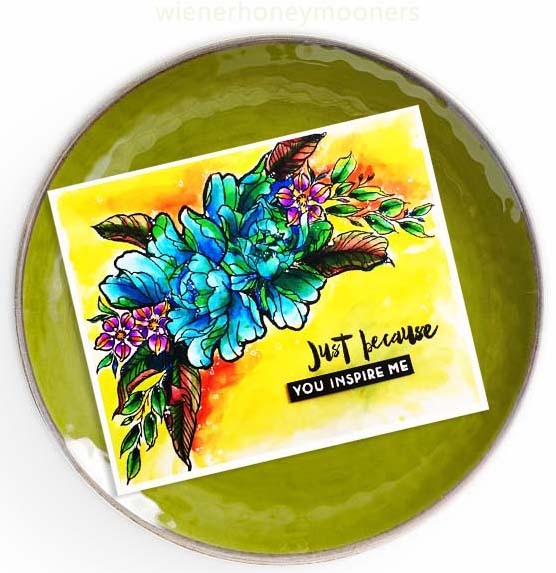 LOVE LOVE LOVE the vibrant color style on your beautiful cards! That is some rock star coloring, TFS! Kimberly you have made bright and beautiful cards my fneied! Happy Happy Anniversary, many, many more! The colors on these cards are so vibrant. They are gorgeous. The brighter the colors, I really like. Love your beautiful coloring and bright backgrounds. Your card just pop in those bright colors & fabulous coloring. Beautiful cards! Love the pops of color! Thank you for sharing! I'm impressed by your bright cards for Rubeena. Thanks for supporting your friend. Such beautiful coloring. Love both of these cards. So pretty. Love the yellow background. Thanks for being a part of this Blog Hop. Those are both beautiful bold cards! I love the bright colors! Thanks for the inspiration! You sure know how to make the vibrant colors work! Isn't it fascinating how so many artists can make a stamp set so unique ? Love the bright yellow background! Your coloring has a stained glass quality to it. Congratulations on 10 years of marriage! 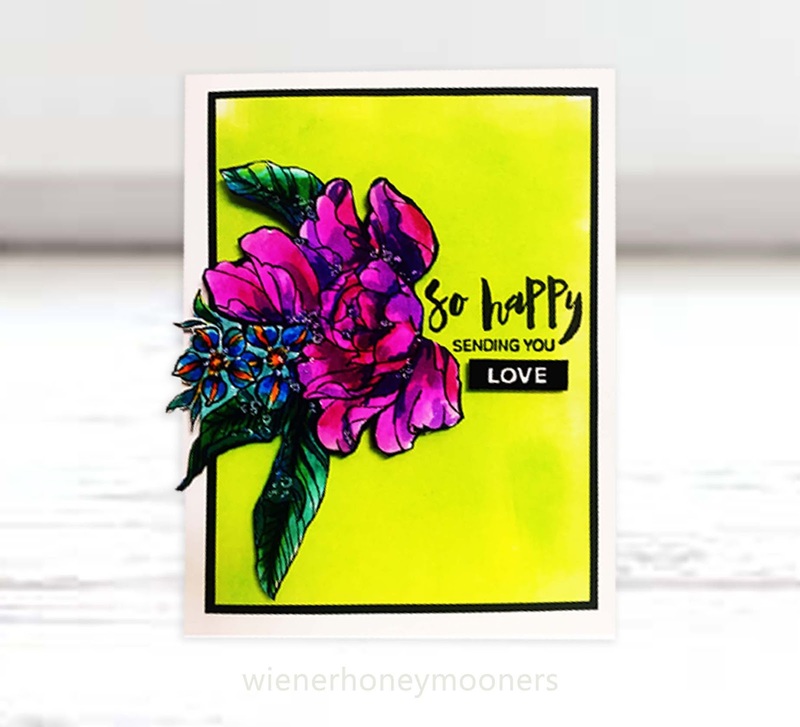 I absolutely love these bright happy cards! The yellow really makes the florals pop & your coloring is gorgeous! Love them both! Yay! Such gorgeous vibrant colors! I've never ever seen a card using yellow for the background like you've done. I LOVE it, but that doesn't take away from your talent of coloring the flowers. Wow wow wow!! Gorgeous bright colors... just POW! Wonderful cards!! So eye-catching! I love how rich and vibrant the colors are. Happy 10th Anniversary! Hope it was a great one! Such bright and colorful cards! I really like the floral image on your first card. I didn't realize that was a Stephanie Lowe designed stamp set. I just recently saw her floral feathers set and fell in love with it. Thanks for sharing your cards and being a part of this crafty celebration! Such a wonderful set of cards! Love the bright colors Kimberly! Thanks for the inspiration! And happy belated anniversary to you too! Fabulous cards! I love the yellow background with the greens and oranges as highlights - spectacular! WOW! 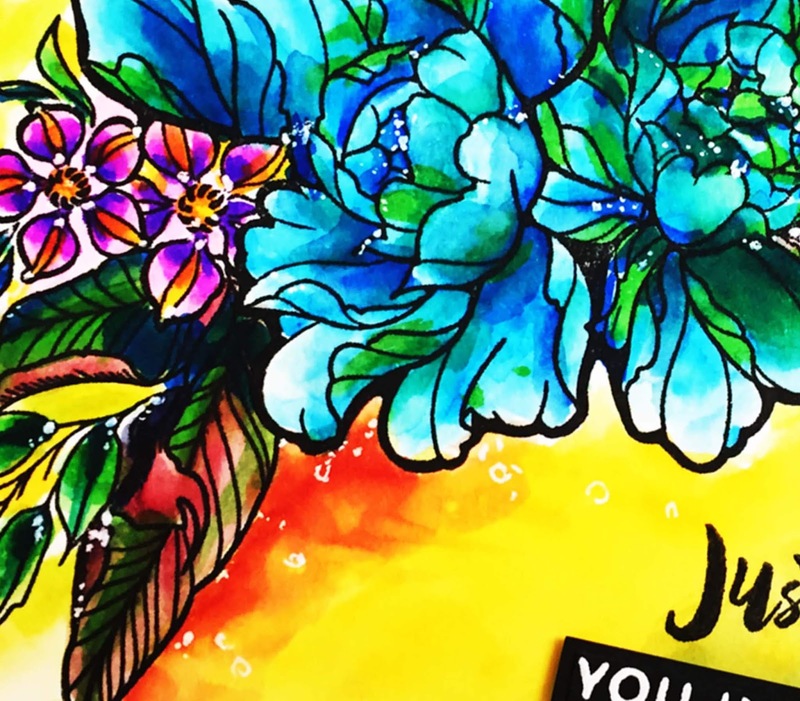 The bright yellow nearly makes the bold flowers jump right off the card! What a Sunny, bright, happy card! TFS--Have a blessed evening. Huge congrats on your 10th anniversary! Love these bold and beautiful cards! That yellow background is awesome! SO bright and beautiful!! Congrats on your 10 year Anniversary. Congrats to Ruby as well! Wow! do your flowers ever pop against that yellow background...yellow not a color I use a lot of, but maybe should! Thanks for sharing and for supporting Ruby's anniversary! Amazed by your gorgeous card!!!! Love these fabulous watercoloring!! Wow so vivid and bold especially with the yellow background. Beautiful and vibrant cards. Happy Anniversary! Whoa! both of your cards are absolutely stunning. I was told blues and yellows will make a graphic more visible/readable and pop in the card making. Yours definitely has the beautiful wow factor. Thank you so much for sharing. Wow, just WOW! 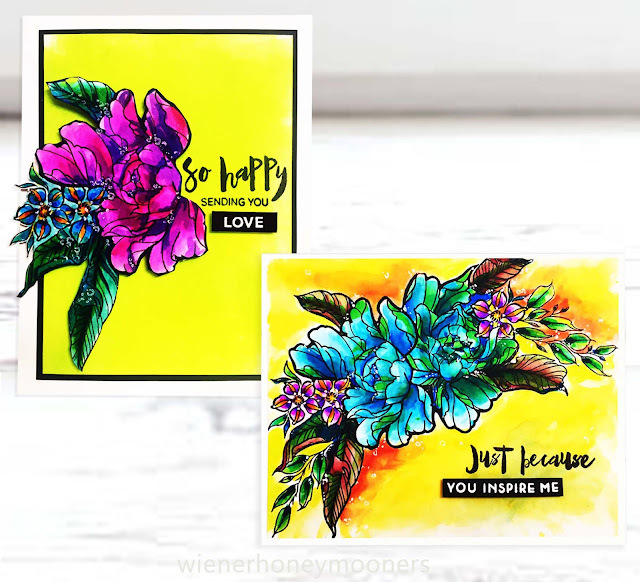 Your coloring on both cards is breathtakingly gorgeous and the yellow background just makes the colors explode, I love it! Thanks for the inspiration. what unexpected and happy colors! These are great cards ! Very unique style ! So fun with the vibrant colors. Happy belated anniversary! 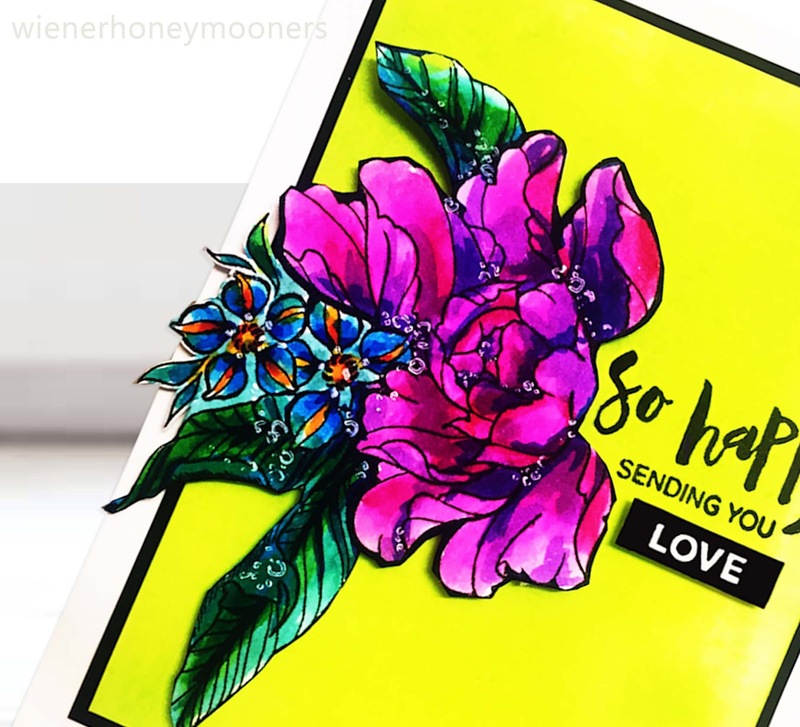 Gorgeous colouring on your pretty cards. The blog is nice with bright colors which makes the look different.